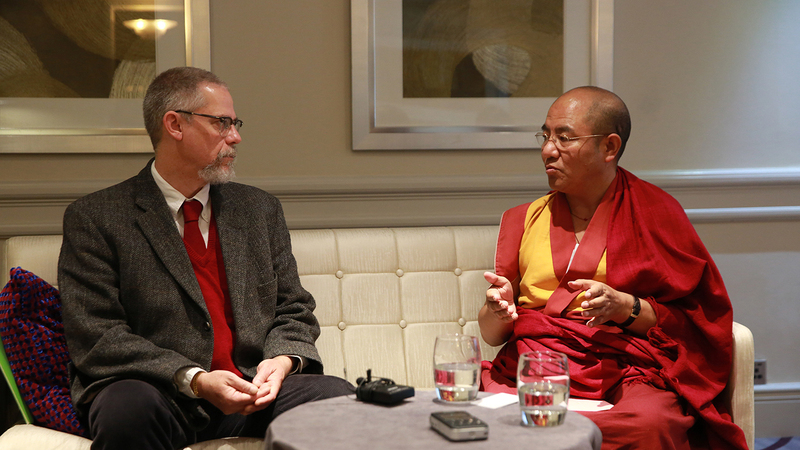 On October 25, 2015, Khenpo Sodargye Rinpoche was invited to the University of Aberdeen to have a conversation with Dr. William Tuladhar-Douglas. In the conversation, Khenpo offered several simple yet effective meditation practices to both university students and ordinary people. In addition, he provided some guidance for dharma practitioners on how to practice in daily life. As both a Vajrayana practitioner and a university scholar, Dr. Tuladhar-Douglas shared his research on the relationship between Buddhism and science, and his personal experience and gain in studying and practicing Vajrayana Buddhism. For the video of this conversation, please click here.